Jason Lindner is receiving a lot of well-deserved attention as the keyboard player on David Bowie’s excellent “Blackstar” album, but he’s been a fixture on New York’s jazz and improvisational music scene for over 20 years. He has led his own big band, recorded and toured with Meshell Ndegeocello, Claudia Acuña, Anat Cohen, and Donny McCaslin, and leads the electric and eclectic Now Vs Now. Jason started playing by ear almost as soon as he could reach the keys of his father’s piano. “My father’s a pianist and vocalist and back then he did tons of club dates and theater gigs working with entertainers and comedians and such. At some point he vocal-coached Pat Benatar.” Jason’s first synth experience came at about age 10 with his father’s Moog Rogue, though–at the time–he chose to focus on acoustic piano. Starting formal piano training at 7, Jason honed his skills playing in school bands. He was accepted to New York’s LaGuardia High School of Music and Art after a performing a solo piano audition of Herbie Hancock’s rendition of Thelonious Monk’s “Round Midnight” that he’d learned by ear. Later, as he embarked on his career in music, Jason added first electric piano, then a workstation keyboard, and, eventually, a couple of virtual analog synths. But it wasn’t until he was a member of Meshell Ndegeocello’s band that he seriously started to explore synths. “At that time, Meshell said she didn’t even want me to play Rhodes, only synths, and I was like, ‘Are you sure? That’s not my forte,’ and she said, ‘I believe you can do it.’” Dissatisfied with his VA synths, he made the switch to genuine analog, including a Prophet ’08 Special Edition. The story of how Donny McCaslin’s band–of which you are a member–came to work with David Bowie on “Blackstar” has been covered pretty extensively elsewhere, so I won’t ask you to recount that here, but I am curious what the next step looks like: How do you prepare for something like that? You prepare by being prepared. Certain things you can’t prepare for except to be open and ready to deal with whatever happens. I could’ve never imagined what it would be like to be in the studio with David Bowie and Tony Visconti. But I knew I wanted to prepare the material the best I possibly could. Donny had emailed us a bunch of David’s demos and we did our homework both individually and as a group; we rehearsed, Donny made some charts, which were really helpful for the learning process. We talked about what our approach should be as a band and did our best to remain true to ourselves and in our comfort zone while nailing the music. The demos were pretty complete. They had programmed drums, David’s awesome guitars and other parts played by Tony Visconti and others I believe. Most contained scratch vocals where not all the lyrics had been worked out yet, but the melodies and vibe were there. There weren’t many keys parts on the demos but when there were, I adapted them to my instruments. I did most of the synth programming on the Prophet ’08, Prophet 12 and Mopho x4. I had to learn many guitar parts as well and somehow transform them into keys parts. Other parts I invented at home or in the studio, where it would all morph and get turned upside down, and some parts, which once seemed cool, would end up being abandoned for more favorable ones. But it’s important to be flexible and leave that space to change it up because that’s the magic of the studio and you gotta go with it. When I didn’t have a specific idea for a sound I defaulted to one of the (New York Studio) Magic Shop’s two vintage Wurlitzer electric pianos, or I would dial in a basic patch on my Prophet ’08 as a sort of blank canvas sound. The Prophet ’08 had such a great character in that session. It has an organic quality and it matches incredibly well with acoustic instruments. The Prophet 12 produced some beautifully edgy, full pads with ringing metallic overtones that really fit the more intense moments. You use a number of stompboxes to process your synths and electric pianos. Did you track with effects in the studio? I had my pedal chain running through a Fender Twin Reverb amp. The pedals were set up on a table that I could move to whichever instrument I wanted to track on. We were trying to sculpt the sound right there, as if we were on a live gig. James Murphy (LCD Soundsystem) had some really cool ideas that intensified the sonic palette even more. We were working with the ultimate production team. What’s actually in your pedal chain? Delays were the first pedals that I got. Delays just make everything sound good. I have a Way Huge Aquapuss, an MXR Carbon Copy, and a Moogerfooger MF-104. I also have a Fulltone OCD and one of my favorite, favorite pedals is the WMD Geiger Counter, which is a sort of bit crusher but much more. So I have a really not extreme, or very warm tubey distortion and a really extreme digital weird distortion. Luckily I came across the Geiger Counter before my first studio date with Donny. I was imagining pushing the Wurlitzer into wacky sonic universe and tried all kinds of pedals. 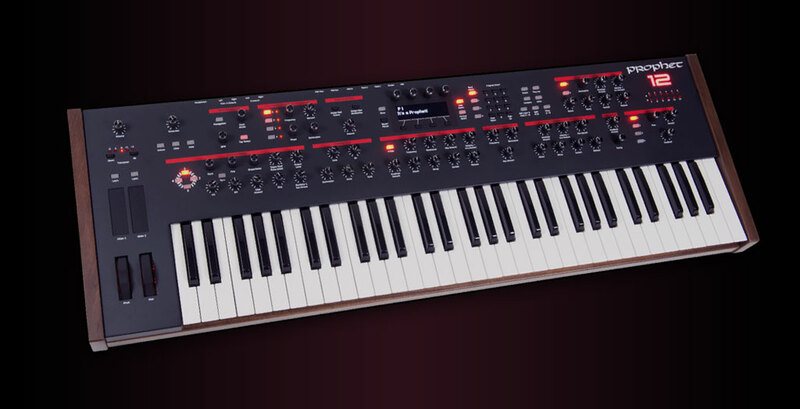 Now that you have the Prophet-6, are you using the onboard effects in that? Yeah. The delays and reverbs get used the most. I like the chorus, too. You’ve used quite a few DSI synths. Can you speak a little about that? I initially got into the Prophet ’08 for the obvious reasons: it’s a poly synth, it’s analog, and it’s flexible, especially when compared to older synths. The Mopho x4 became my road synth, and then ended up being my local gig synth because with all that time on the road, I had more time to program it. Then I’d dump those sounds back into the Prophet ’08. When Donny McCaslin played six nights at the Village Vanguard, I forced myself to reprogram all my sounds from the x4 in the Prophet-6 and I’m using that on tour now when I can. Playing nightly was awesome since I had the chance to become familiar with that beautiful instrument. 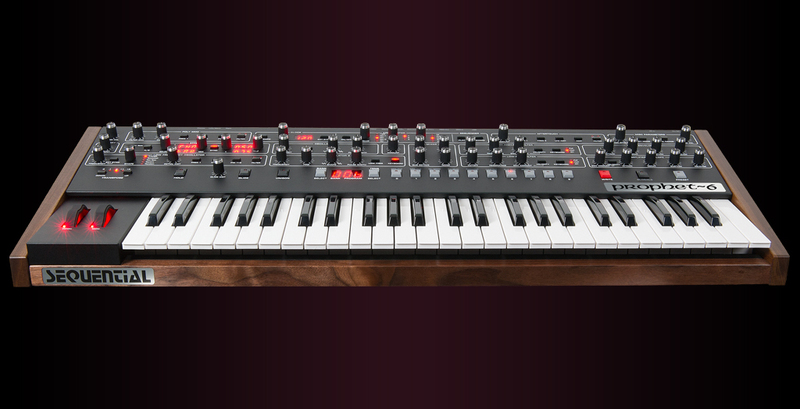 The Prophet 12 is pretty different with the digital oscillators and FM capabilities. The tuned feedback is super cool. The character effects are incredible. That’s right up my alley and tweaking those in real time is really great. How does going from 12 voices to as few as 4 affect you? It’s a cool limitation, because you have to pick and choose and use the keyboard transpose switches. Sometimes one or two notes are all the music needs. I dig it. I think it’s more productive for finding parts, too. Many great artists speak of placing limitations to push creativity. Your playing with Donny McCaslin led directly to your involvement with Bowie. The McCaslin band features somewhat straight ahead jazz instrumentation, but the music is anything but. [Bass guitarist] Tim Lefebvre, [drummer] Mark Guiliana, and I like to get weird, and we share many influences through rock, funk, punk, electronica, reggae, dub, jazz, etc. Our chemistry is something special and unique. We like to make a mess of things, to open it up and get really free, go to other dimensions. We’re truly lucky Donny is gracious enough to give us such freedom as his rhythm section. New Donny McCaslin album dropping soon on Motema by the way! What’s the current state of Now Vs Now? Now Vs Now is working on a 3rd album, with Justin Tyson on drums and Panagiotis Andreou on bass. The music’s evolving and I’m really excited to play this for people. Did you use the x4 or the Prophet ’08 on the first two albums? Which instruments are you using on the new album? Everything! [laughs] I love the Prophet 12. That’s getting used and I feel like I’m only scratching the surface. That’s a beast of an instrument. Just incredible. And the Prophet-6, too. Very inspiring. One of the most exciting things about seeing you perform live is the way you really push the instruments and, maybe, the audience’s expectations, as well. These instruments are made to be pushed. Isn’t everything? When I take a solo on a synth, I’m working with a different set of tools than as a pianist, for example, and playing synths absolutely is changing the way I approach the piano, as well. The range of sonic possibilities makes it so I might begin a solo as one sonic character and end up in another dimension entirely. I just try to be in the moment and to prepare to be able to channel whatever energy the moment is calling for. It’s very rewarding because I never know where it’s going and I’m always surprised. So I hope to push those expectations every time.